I’ve always intended on painting the shop floor. It makes it look nicer and it’s easier to clean. The yellow strip doesn’t really signify anything. It was just a clever way of separating the two different floor paint products I used. The paint closest to the wall is a single part floor paint, the other is a two part epoxy floor paint. I’d had them kicking around for a couple of years before I got around to using them up last week. 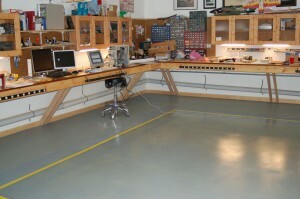 The whole floor wasn’t painted either – just the corner area where the workbenches are. The paint is extremely expensive, especially for the two part epoxy type. ← Series One is completed!